By day four the Oscar Pistorius murder trial has settled into a routine and the excitement appeared to have died down for most journalists. Unlike on Monday, only a handful of journalists entered court GD when security guards opened the doors, checked their accreditation tags and let them in shortly before 9am. Outside the court only three cameramen were getting into position to catch the paralympian make his entrance. Two of them had stepladders to get a better view while a third used two plastic crates. Pistorius appeared far more relaxed during court proceedings on Wednesday, even smiling on one or two occasions. On Thursday he was already at his place in the dock at 9am, looking at some papers on his lap. Questioning of State witness Charl Johnson was expected to continue on Thursday. 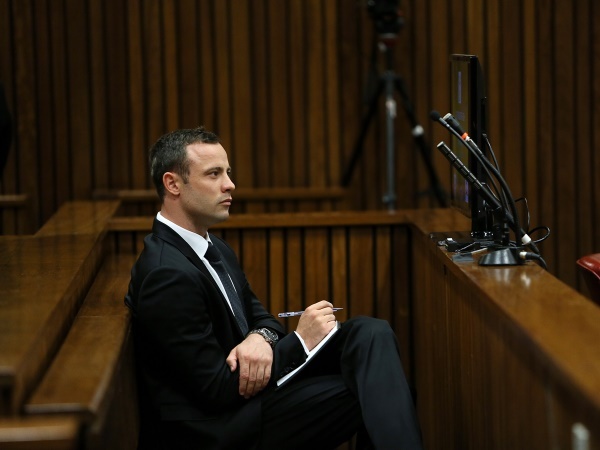 His testimony was interrupted on Tuesday to allow the State to get notes he and his wife Michelle Burger had made on their laptops about the shouting and gunshots they heard from Pistorius's Pretoria home in the early morning of February 14 last year. Six witnesses have testified so far. Pistorius is accused of the murder of his girlfriend Reeva Steenkamp in his Pretoria townhouse. He is also charged with illegal possession of a firearm and ammunition, and two counts of discharging a firearm in public. He allegedly fired a shot from a Glock pistol under a table at a Johannesburg restaurant in January 2013. In September 2010 he allegedly shot through the open sunroof of a car with his 9mm pistol while driving with friends in Modderfontein.